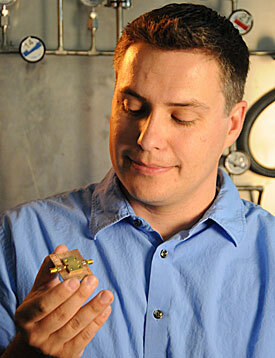 NIST research affiliate John Teufel, who designed the micro drum, with a chip holder used to contain the drum during experiments in which the drum was cooled to its lowest possible energy level, the quantum ground state [photo credit: Burrus/National Institute of Standards and Technology]. Showcasing new tools for widespread development of quantum circuits made of mechanical parts, scientists from the National Institute of Standards and Technology (NIST) have demonstrated a flexible, broadly usable technique for steadily calming the vibrations of an engineered mechanical object down to the quantum "ground state," the lowest possible energy level. Described in a Nature paper posted online July 6 , the NIST experiments nearly stop the beating motion of a microscopic aluminum drum made of about 1 trillion atoms, placing the drum in a realm governed by quantum mechanics with its energy below a single quantum, or one unit of energy. Like a plucked guitar string that plays the same tone while the sound dissipates, the drum continues to beat 11 million times per second, but its range of motion approaches zero. The cooling technique and drum device together promise new machinery for quantum computing and tests of quantum theory, and could help advance the field of quantum acoustics exploring the quantum nature of mechanical vibrations. NIST scientists used the pressure of microwave radiation, or light, to calm the motion of the drum, which is embedded in a superconducting circuit . The circuit is designed so that the drum motion can influence the microwaves inside an electromagnetic cavity. The cooling method takes advantage of the microwave light's tendency to change frequency, if necessary, to match the frequency, or tone, at which the cavity naturally resonates. "I put in the light at the wrong frequency, and it comes out at the right frequency, and it does that by stealing energy from the drum motion," says John Teufel, a NIST research affiliate who designed the drum. Teufel led the cooling experiments in NIST physicist and co-author Konrad Lehnert's lab at JILA, a joint institute of NIST and the University of Colorado Boulder. Compared to the first engineered object to be coaxed into the quantum ground state, reported by California researchers last year, the NIST drum has a higher quality factor, so it can hold a beat longer, and it beats at a much slower rate, or lower frequency. As a result, individual packets of energy, or quanta, can be stored 10,000 times longer (about 100 microseconds)—long enough to serve as a temporary memory for a quantum computer and a platform for exploring complex mechanical and quantum states. In addition, the drum motion is 40 times greater per quantum, offering the possibility, for instance, of generating larger entangled "cat states"—objects that are in two places at once and also entangled, with properties that are linked even at a distance—for tests of theories such as quantum gravity. 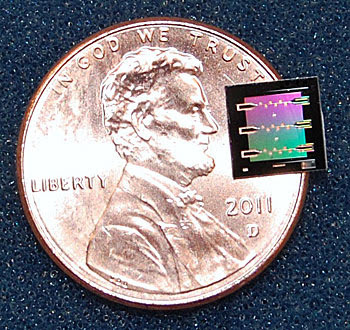 The NIST apparatus also allows researchers to measure the position of the drum directly, which is useful for force detection, with a precision closer than ever to the ultimate limit allowed by quantum mechanics. To make engineered bulk objects obey the rules of quantum mechanics, typically observed only in atoms and smaller particles, scientists must lower an object's temperature beyond the reach of conventional refrigeration. The California researchers were able to use a passive cryogenic refrigeration technique to chill their high-frequency device enough to reach the ground state, avoiding the need for specialized techniques. NIST's drum required the use of "sideband cooling" to reach much colder temperatures, taking advantage of strong interactions between the drum and the microwaves. This is the same idea as laser cooling of individual atoms, first demonstrated at NIST in 1978 , concurrently with another research group in Germany , opening a new field of research on ultracold atoms. Now a basic tool of atomic physics worldwide, laser cooling enabled many significant advances by allowing researchers to reduce the vibrational motion of trapped atoms to less than a single quantum. Sideband refers to a collection of light particles (photons) just above or below a specific target frequency. In the case of NIST's superconducting circuit, this stray radiation pressure, as it adjusts to the surrounding environment of the cavity, steadily removes energy from the drum motion in the same way that laser cooling slows atoms in a gas. In the NIST experiments, the drum is first chilled in a cryogenic refrigerator using liquid helium. This lowers the drum energy to about 30 quanta. Sideband cooling then reduces the drum temperature from 20 milliKelvin (thousandths of a degree above absolute zero) to below 400 microKelvin (millionths of a degree above absolute zero), steadily lowering the drum energy to just one-third of 1 quantum. Scientists begin the sideband cooling process by applying a drive tone to the circuit at a particular frequency below the cavity resonance. The drumbeats generate sideband photons, which naturally convert to the higher frequency of the cavity. These photons leak out of the cavity as it fills up. Each departing photon takes with it one mechanical unit of energy—one phonon—from the drum motion. At a drive intensity that corresponds to 4,000 photons in the cavity, the drum motion slows to less than 1 quantum. By detecting the scattered photons leaving the cavity, scientists can measure the mechanical motion near the lowest possible limits of uncertainty. Collectively, these steps proved that the mechanical drum entered the quantum regime. The drum apparatus has applications in quantum computers, which could someday solve certain problems that are intractable today, even with the best supercomputers. Quantum information can be stored in the mechanical state for more than 100 microseconds before absorbing one phonon from the environment—much longer than conventional superconducting quantum bits can maintain information. The drum, thus, might serve as a short-term memory device in a superconducting quantum computer circuit, a technology under development by the same NIST research group. In addition, because mechanical oscillators can interact with light of any frequency, they could act as intermediaries for transferring quantum information between microwave and optical components. J.D. Teufel, T. Donner, Dale Li, J.W. Harlow, M.S. Allman, K. Cicak, A.J. Sirois, J.D. Whittaker, K.W. Lehnert and R.W. Simmonds, "Sideband cooling of micromechanical motion to the quantum ground state", Nature. Posted online July 6, 2011. doi:10.1038/nature10261. Abstract. J.D. Teufel, D. Li, M.S. Allman, K. Cicak, A.J. Sirois, J.D. Whittaker, and R.W. Simmonds, "Circuit cavity electromechanics in the strong coupling regime", Nature, 471, 204–208 (10 March 2011). Abstract. D. J. Wineland, R. E. Drullinger, and F. L. Walls, "Radiation-Pressure Cooling of Bound Resonant Absorbers", Physical Review Letters, 40, 1639–1642 (1978). Abstract. W. Neuhauser, M. Hohenstatt, P. Toschek, H. Dehmelt, "Optical-Sideband Cooling of Visible Atom Cloud Confined in Parabolic Well", Physical Review Letters, 41, 233–236 (1978). Abstract.